This past year I tasted a tremendous number of wines from around the world, but some wines really resonated with me. It may have been the great balance of fruit, sugar, acidity for a white wine, or the fruit, tannins and minerality in a red wine, or something else. Something that made the wine stand above the other wines. Could it be terroir? The use of organic farming principles? The perfect weather and harvest? The natural yeasts on the grapes fermenting? These are all possible explanations to why these wines earned my top scores for 2016. They are all either 4.5-5 or fully 5 star wines. The wines do come from around the world, as well as here in BC. We can and do make top quality wines. Enjoy reading my tasting notes and I invite you to purchase these wines and share them with family and friends. Celebrate. 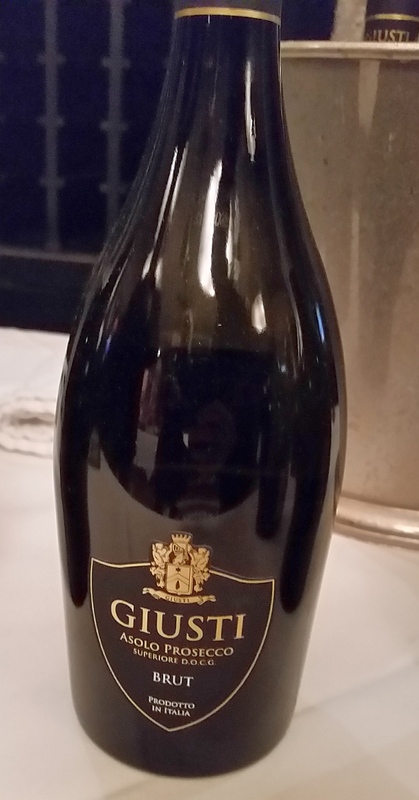 Schug Carneros Estate Winery Carneros Chardonnay, California, 2014 – All French oak barrels, and again with lees aging. Lots of tropical fruit on the nose. Dry, with medium minus mouthfeel. Light toast, sweet spices, vanilla and tropical fruit. An all-round, balanced wine. 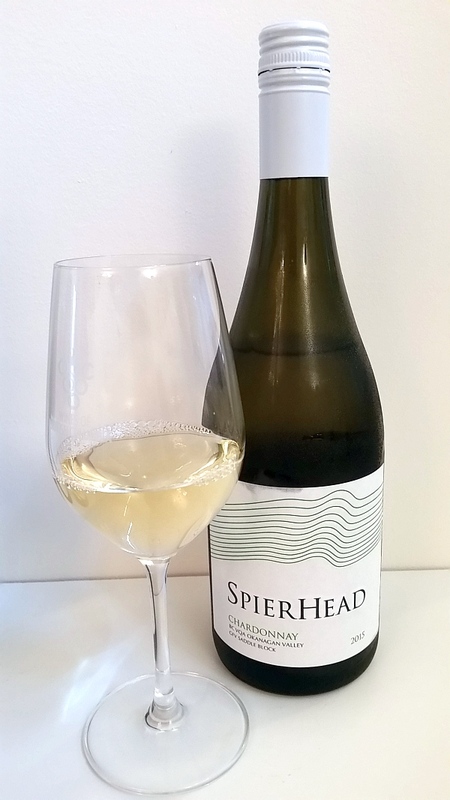 SpierHead Winery Chardonnay 2015, BC – A deeper lemony gold in colour. It has an intensely tropical fruit and vanilla nose, followed by lemon and butter. With decanting it adds some leafiness and nutmeg. The wine is dry, with medium acidity, but is very full-bodied; silky, round and heavy in the mouth. It really feels like QUALITY. You also get light acidic prickle upon first sip. The wine has mostly tropical fruit flavours, followed by pears, apricots, apples, and hints/texture of oak, vanilla and butter. Medium plus length, finishing with more tropical fruit, some apricot, and sweet spices at the very end. A bigger, riper Chardonnay that you want to show off with a delicious roast chicken, or maybe dare to pair with a roast suckling pig! Moraine Estate Winery Riesling 2015, BC – Very nice, light intensity, Mandarin orange nose. Semi-sweet, with medium minus body, and medium plus acidity. Flavours of apricots and Mandarin orange. This wine dries up nicely on the finish, with some honey flavour. Excellent! 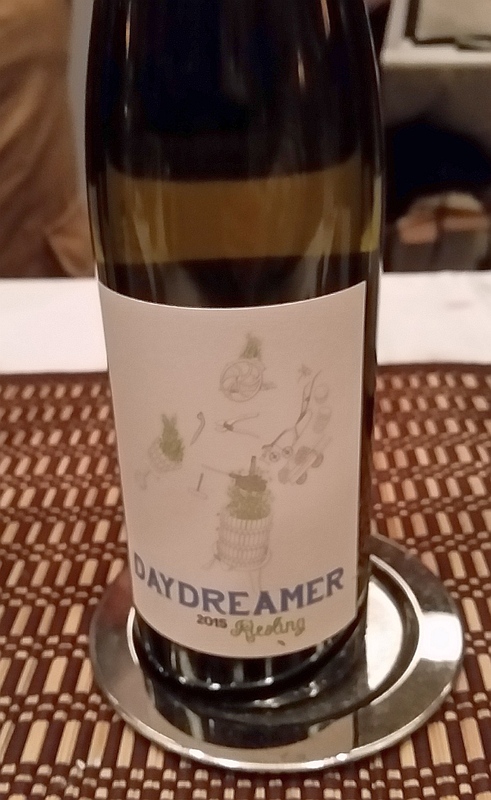 Daydreamer Wines Riesling 2015, BC – It has aromas of green fruits, pine needles, orange, lime and dried apricots. Medium bodied, dry with a round mouth feel. Medium plus acidity. Flavours of peach, pine needles, guavas, limes and oranges, and finishes with honey. An excellent wine that you should buy several bottles and enjoy as this wine ages. Cono Sur Viognier Reserva Especial 2013, Chile – Ripe pears and the nose, which followed through onto the palate. This wine has medium plus body, round, and full of fruit. I mentioned pears, but there was also flavours of dried peaches. The wine was so full flavoured, it almost tasted off-dry. Medium plus acidity to keep the wine balanced. Latour-Giraud Meursault-Genevrieres 1er Cru 2012, Burgundy – This wine has nice light spice, candied lemon and vanilla aromas. Medium body, soft and supple, with tropical fruit and sweet spices up front, with peaches and nutmeg on the mid palate, and mouth watering acidity on the finish. Giusti Umberto 1 2008, Italy – This wine is made with the best Merlot, Cabernet Sauvignon grapes coming from vineyards located in the Veneto region according to Giusti. A very nice sweet, ripe dark fruit and sweet spice nose. Also hints of red fruit and floral. Full body, round and dry, with a medium mouth feel. Ripe juicy cherries and sweet spices. Fresh fruit considering this wine has already 8 years of bottle aging. A hint of capsicum along with a peppery finish. 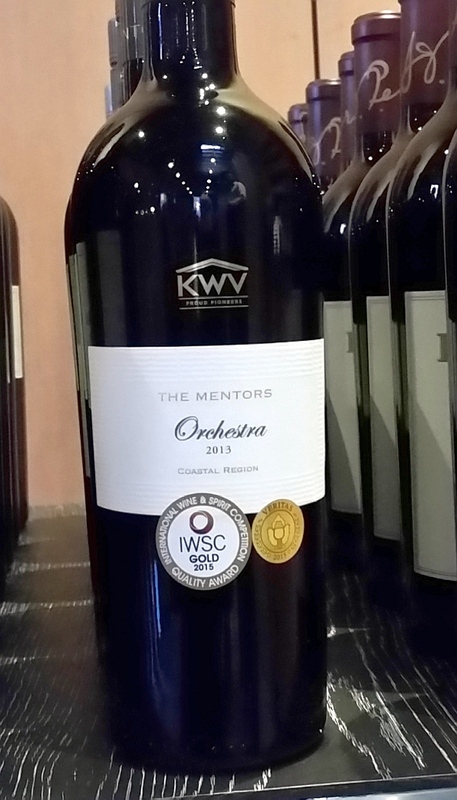 KWV The Mentors Orchestra 2013, South Africa (SPEC $28.69) – My favourite red wine of the evening. This wine is a Bordeaux blend, consisting of 52% Cabernet Sauvignon from Paarl, 17% Merlot, 13% Malbec, 9% Cabernet Franc, and 9% Petit Verdot, all coming from Stellenbosch. Dusty, dark ripe fruit nose. Medium plus body, round and silky, with a heavier mouth-feel. Medium plus acidity. Lots of ripe fruit with a floral component. Firm tannins. There isn’t anything that I would add or subtract from this wine. It is wonderfully balanced. Stonestreet Winery Rockfall Cabernet Sauvignon, California, 2010 – Nearly opaque ruby colour in the glass. Lighter intensity nose, with ripe cherries, capsicum, and cocoa on the nose. Dry and round. Medium bodied with some minerality. A mix of red tart fruit and dark ripe fruit, along with vanilla and sweet spices. A complex wine. Santa Carolina Herencia Carmenere 2010, Chile – Carmenere is the signature red grape of Chile, and this wine looks towards its heritage, or “Herencia”. This wine is primarily Carmenere, but has 6% of Cabernet Sauvignon and Malbec blended into it. Dark fruit, tar, leather and cedar notes on the nose. Medium plus body with lighter mouth feel. It is peppery, flowery, and has sweet purple fruit flavours. Light vanilla and sweet spice accents. I also picked up some salty minerality in this wine. A very well-rounded wine. 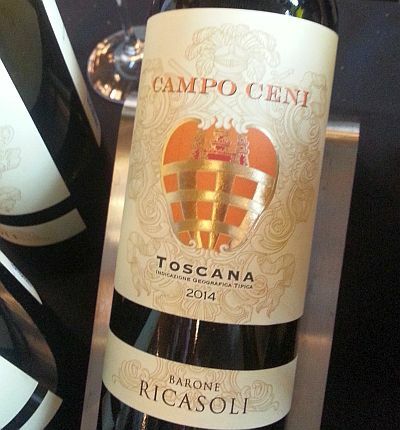 Barone Ricasoli Campo Ceni 2014, Italy – I don’t think Barone Ricasoli can make a poor wine. I really enjoyed every wine they poured at the Vancouver International Wine Festival 2016. I was told that this winery in 1872 set the “recipe” for Chianti, and are the oldest winery in the Chianti region. Interesting nose with nutmeg and meatiness. Medium body, dry with some smokiness and elegant minerality. Red cherries and fine tannins. Masi Agricola Riserva Costasera 2009, Italy – Smoky, meaty, dark chocolate on the nose. Ripe dark fruit and cocoa flavours. Off dry. Fine tannins. Tedeschi Amarone della Valpolicella 2011, Italy – Smoky, flinty nose. Full body, smoky, mineral and firm tannins. Quite fruity, with red and black fruit flavours. Pio Cesare Barolo 2011, Italy – I have tasted some Pio Cesare wines before at other events, and they always stand out in my wine. 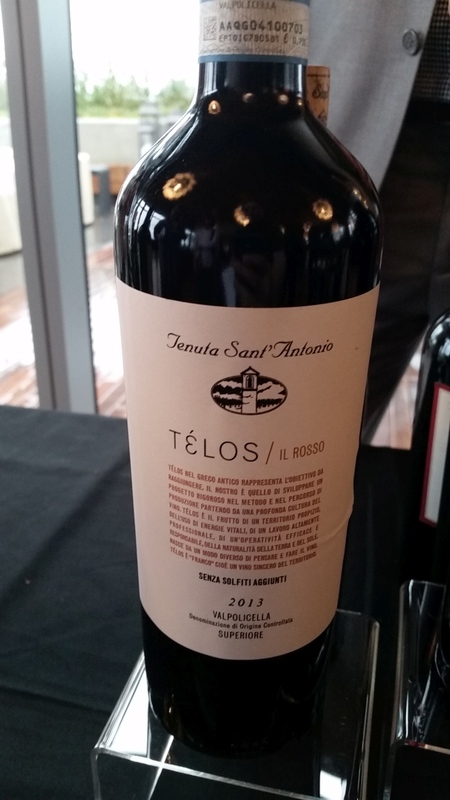 This wine has a beautiful nose with red fruit and cedar. Light body, dry with medium tannins. Red cherries, apples and oak. A very elegant wine! 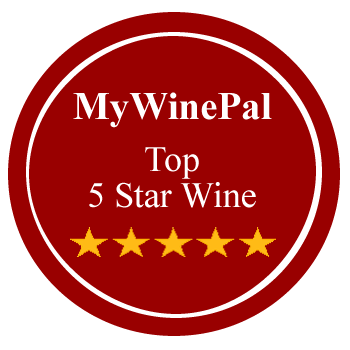 If you tasted some wines in 2016 that you think are worthy of 5 stars, please post your wine info below. Thank you!